Myself and two dancers from our show stayed after a performance to play with the audience. A young boy challenged our lead Bboy to a battle. After a full song of building tension and raucous applause Fritz (our Bboy) let the young boy win. It resulted in a wave of uproar and cheering from his young comrades. 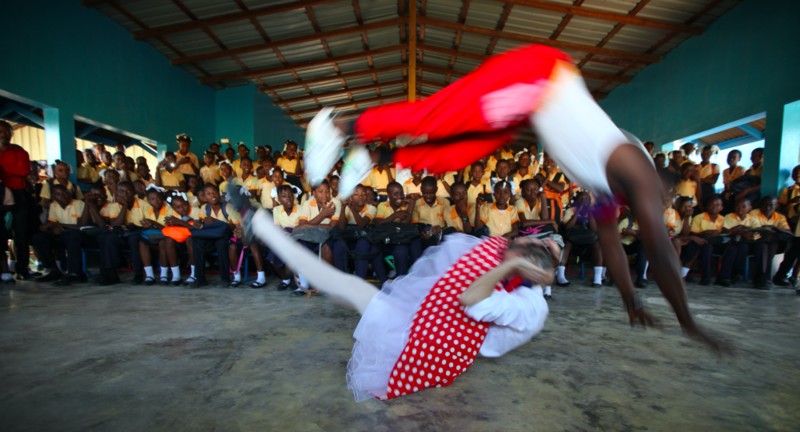 It was a wonderful moment of solidarity, Creole hip hop and death drops. This tour focused on violence against women and children. The team created a 30-minute show for women and children who have experienced violence. They also led workshops that focused on using art as a tool against violence. As part of this tour, the team created a photo exhibit and small documentary. This team performed in Haitian prisons for women and minors. They also worked with Aksofam: (Association de Femmes Bénévoles Venant en aide aux Femmes et Enfants Esclaves), an organization that works with women and children who have been enslaved. In 2014, the United Nations’ Human Rights Committee reported a steady increase in sexual and gender based violence. In 2017, CWB – USA partnered with MSF-Holland’s program against SGBV. MSF reports that over half of their SGBV patients are under the age of 18. This tour strives to bring moments of laughter to women and young people who have experienced violence. The team is from Canada, Haiti, and the United States. James Saint Félix (Haiti), and Montana Debor (USA). James is the founder of Cie Lobo, a program in association with the national arts academy of Port-au-Prince. Brigitte is a comedian and singer from Canada. Montana is a circus artist and instructor based in Atlanta, Georgia. She has worked with CWB – USA at a number of benefits and at the Smithsonian Folklife Festival. This is her first international tour with CWB – USA. Katel Le Fustec is the coordinator and photographer for this tour. She has been the director of Clowns Sans Frontières – Canada since 2008.